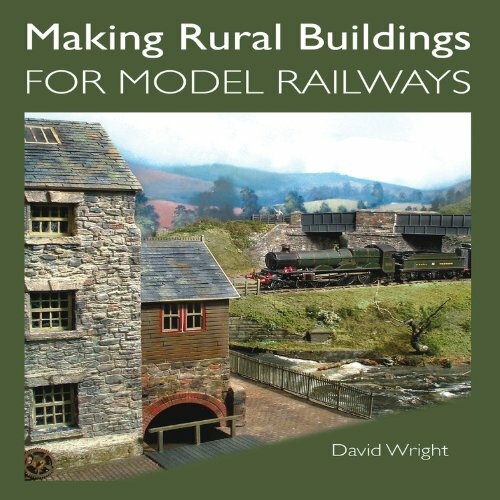 Making Rural Buildings for Model Railways by David Wright is an absolute gem covering the rural building in considerable detail, both researching the prototype and building the model. Essential reading for all those who are interested in developing their modelling skills and creating realistic models of country houses, cottages and farm buildings for their railway layouts. David Wright encourages and inspires the reader and, moreover, emphasizes that railway modellers can achieve their objectives without purchasing expensive materials. Indeed, all the materials recommended in the book are either recycled or can be obtained quite cheaply. The first chapter looks at Britain region by region and the buildings to be found in each along with their construction techniques – including stone, wattle and daub, Elizabethen style, brick; different types of roof materials and ridgeware; bargeboards and facias, chimneys, gables, doors, windows, drainpipes and gulleys etc, etc. Chapter two covers research, collecting photographs, how to calculate a buildings measurements from drawings and photos, taking measurements and field photography, and how to construct a working drawing from photo. Chapter three gives a comprehensive guide to the different methods used to construct models and how to scale them, from constructing the basic shell, scribing stonework and brick, constructing accurate windows and glazing, making different doors, frames and door furniture, to fitting the roof, including how to get the bows so often seen on age old roof lines, how to make the different roofing materials such as tiles, pantiles, thatch, and all the extras such as ridge tiles, lead flashing, chimneys, barge boards, different guttering and even dirty lace nets! Chapter four shows how to paint, weather and finish your model using a variety of materials; sprays,oils, watercolours and weathering powders. The use of different additions such as ivy, lichens, rain stains, rust, dirt, weeds, grass and even rodents! Chapter five shows how to set your model in to the landscape around it, basically scenery additions – trees, flowers, water etc. Chapter six gives three different scratch building projects using all the skills shown so far; a country farmhouse in half timber frame with white walls; a Devon thatched “cob” cottage; a derelict limestone field bard showing outside stone steps and overgrown vegetation and a dilapidated roof. Chapter seven shows how you can improve off the shelf kits to make them up to the same standard as unique one off scratchbuilt models. This is then followed by a colour reference sheet; what colours to use to obtain various areas particular stonework e.g. Scottish granites or Cotswold limestone with colour photos giving examples of what each type looks like; a great list of suppliers who stock anything you need no matter what scale you work in. This is followed by a list of further book’s the author finds useful and research materials, and a comprehensive index. 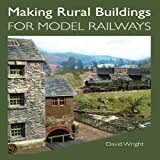 Making Rural Buildings for Model Railways is comprehensive on the subject, it is filled on every page with beautiful colour pictures, detailed instructions, and exacting scale drawings. The wealth of information in here is excellent. David Wright is something rare these days – a true expert on the subject he is writing about. If you only buy one book this year to help with either modelling or railways, make it this one, you won’t be disappointed. Yet another Crowood book that just about perfect. David Wright is a professional artist and model maker who has created many models of rural buildings for model railway enthusiasts, museums and businesses. David has written numerous articles for railway magazines and provides hands-on experience at railway modelling workshops. In addition, he has completed two DVDs, one of which dealt with modelling rural buildings, and is well known at the major railway modelling exhibitions where he provides demonstrations to the visiting public.